Disneyland has been busy decorating its own castle in preparation for the upcoming 60th anniversary festivities, but lets take a moment to return to Europe and check out what I still consider the most beautiful Disney castle, Le Château de la Belle au Bois Dormant (Sleeping Beauty Castle, in English). This castle was designed to come out of a storybook. 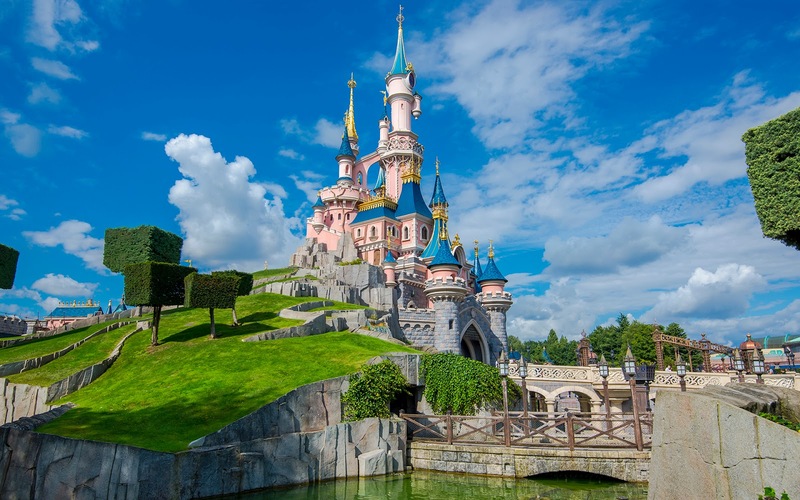 Because of France's (and Europe's) rich history of having real castles, the designers at Walt Disney Imagineering knew that they couldn't construct a regular, rigid palace like they had at Disneyland or Disney World. This had to be something that look ethereal... something out of a fantasy. Something that couldn't be similarly visited just by hopping on a high speed train for a few hours. The result was pretty spectacular. Disneyland Paris' castle is towering and elegant, beautifully slim and structurally imposing at the same time. It's a wonderful backdrop for Disney Dreams at night, deceivingly cheerful cover for La Tanière du Dragon beneath, and splendid icon for the park. Oh, how I wish I could go back already!